Scientific researches have shown time and again that recreation and relaxation of the mind and body are absolutely necessary to bring out the best in every human being. Even more so when you live in a fast-paced metropolis, buried deep in your hectic schedule! That’s probably why cities all over the world have dedicated places for entertainment and fun. And Noida is no exception to this. Touted to be one of India’s most well-planned metropolitans, the city takes pride in its ground-breaking infrastructure, well-laden roadways, prolific business establishments, upbeat shopping malls, avant-garde eateries, and much more. It comes without any surprise that the inmates of this beautiful city and its inbound tourists all resort to different means of entertainment, fun, and frolic. 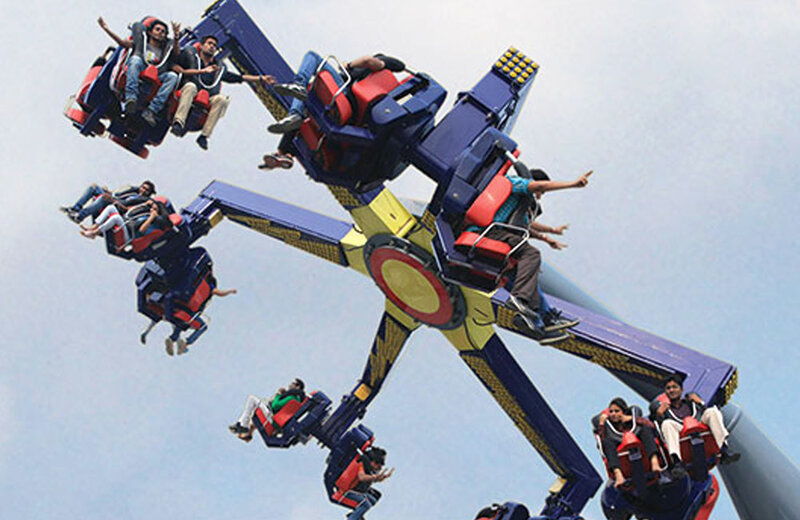 Of the many hangout options in Noida, its water parks, and amusement parks top the list. These parks that represent sophistication, technological advancement and adrenalin-pumping pleasure for the daredevil in you offer respite from the vicious circle of life. Freedom from the squirrel cage is an offer that you just can’t resist, right? So let some muscles loose, sit back, unwind, take a chill pill, and bring out the child in you at these water parks and amusement parks in Noida. Life takes you through several twists and turns, ups and downs, and rollercoaster rides, but the best ones are those that you enjoy at an amusement park. Even more so if there is a live music band to push the tempo in the backdrop! The Worlds of Wonder, popularly called W.O.W is one such venue. The rides here divided into two categories, namely dry rides and water rides and slides. Adrenalin gratification is guaranteed in this 10 acres of cutting-edge fun-o-mania. With over 23 adventure rides that leave you gasping for air, the spell-binding experience at W.O.W is something unprecedented in India. Children can enjoy the time of their lives while adults can have a throwback to their childhood days on these unsparing rides that include Big Beat, Chart Smashers, Bird’s Nest, Download, Rockin Roller, Dizzy Diana, Fast Forward, and Hippti Hop. Experience different levels of blood rush that give you the thrills and chills to last an entire week. The thoughtfully designed La Fiesta zone is meant for kids, senior citizens, and people who need special attention so that no one is spared of the fun times at W.O.W. The water rides and slides here are enough to keep you thrilled at your own pace and time. If you have all day to laze about on a float, then the Lazy River ride will never let you down. The park has a number of action-filled water slides and splash rides, including Turbo Tunnel, Rapid Racer, and a Giant Wave Pool to help bring out the fun lover in you. Be warned that gravity defiance could get you famished which is why this place offers a plethora of food stalls, restaurants, indulgence counters. Hygiene and safety have been enhanced to the highest standards at this fun haven with lifeguards delegated near water rides for the safety of adventure mongers. That’s not all! The VR Gaming Arena, Go-Karting tracks, pool bar, and the Disco Rain Dance Floor with the artificial rain and amazing tunes in the background all offer variety in terms of fun. Go-Karting lessons are also offered to beginners at the venue. In a nutshell, W.O.W offers you a delightful getaway with your loved ones with a promise to put a big smile on those faces at the end of the day. The venue also organizes birthday parties, corporate functions, and social events. This modern indoor family entertainment and skill engagement center is very progressive and academic in nature. It is like a mini learning city for kids where there is never a dull moment. This metropolitan venue is safe, unique, and evidently interactive, and also instills the power to discover, experiment, and learn in young minds. With over 100 engagement activities, Kidzania is a highly functional hub that inspires interactions, social-values, decision-making skills, problem-solving, friendships, creativity, and endless learning. A global brand that was originally founded in Mexico City in 1999, this miniature city helps children connect the dots in real-life scenarios through role-plays and problem-solving activities. The NO RIDE or VIDEO GAMES dictum of this place is challenging and enthusing at the same time. Kidzania also helps develop interest in the minds of children for different careers through their activities like Acting Academy, Animation Studio, Archaeological Site, Arts and Painting, Banking, Aviation, Fashion, Factory Work, Restaurant Management, and Sports. Other popular activities here include Culinary Arts, Dance, Dental and Health Care, Driving School, Dubbing Studio, Public Services, Energy Conservation, Farming, Media, Journalism, Vigilance, Logistics, and many more. There is a set of role-playing and other engaging activities for toddlers and adults. Parents can also unwind at lounges facilitated at the venue or even indulge in the great gastronomical delights from various food counters. Overall this place offers a fun-packed and constructive learning experience that can be treasured for a long time to come. The experiences here, each of which is designed by child psychologists, play experts, and educationalists, contribute to the development of your child’s behavioral skills. 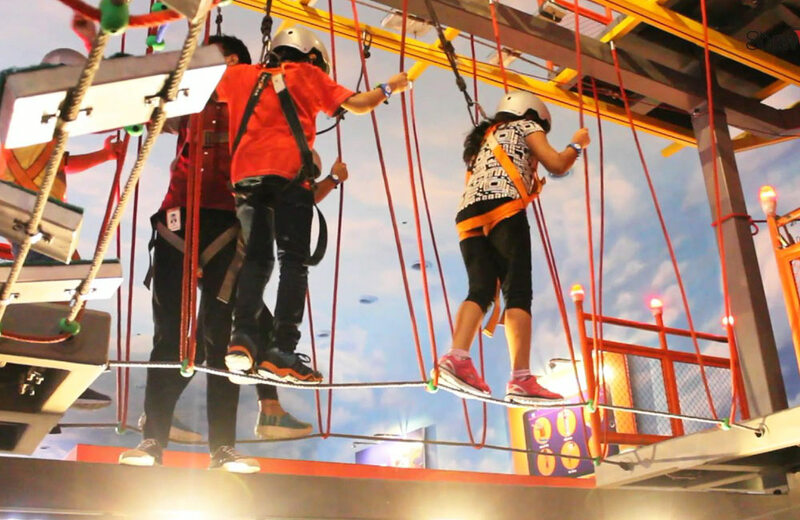 Note: Kidzania also has other packages such as Any 5 Hours, Any 3 Hours, 5 Hours (Early Bird), Last 3 Hours, etc. If you are planning to visit one of the most renowned malls of Noida, the DLF Mall, then you should not miss out on some electric fun time at Smaaash. This epicenter of fun has been initiated to give a futuristic gaming and entertainment experience to its visitors in the limited time that they spend there. Your weekend shenanigans won’t stop at the high-end VR gaming kiosks installed here. Boy and girls can have all the fun with the kitty parties, pre-wedding bashes, birthday events, corporate gatherings, and team-building activities that are organized at this venue. Fancy a drink or two while you engage in all this fun and frolic? The Pub Exchange, an in-house pocket-friendly pub at the arena gives you a real-life feel of a stock exchange’s versatility through betting done on drinks. You get to buy drinks at rock-bottom prices if you are lucky and the stock rate of the drinks crashes while you are at it. You can even binge on some great grub while enjoying your hard-earned drinks. 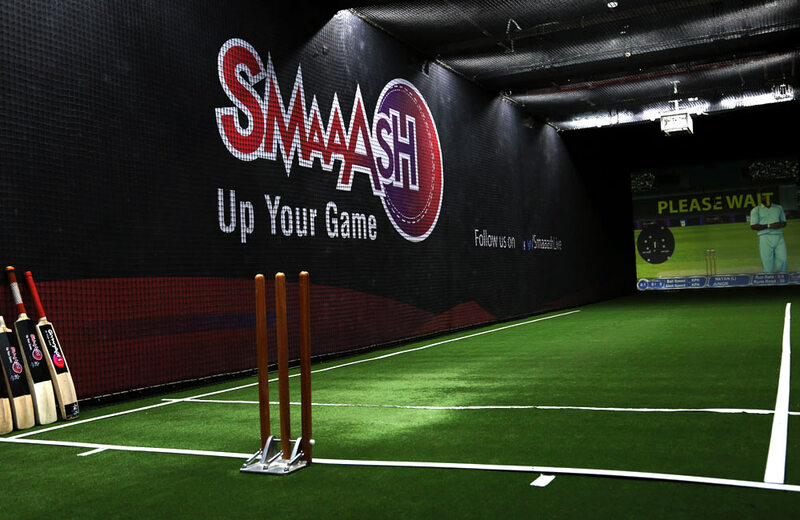 Have an Instagram-perfect time, take memorable snaps at Smaaash, which is smashingly fun with family and friends while you eat, play, celebrate, and repeat. Entry Fee: Prices vary according to the package you choose. If you call enjoying snow and sledding in Noida as wishful thinking, think again! 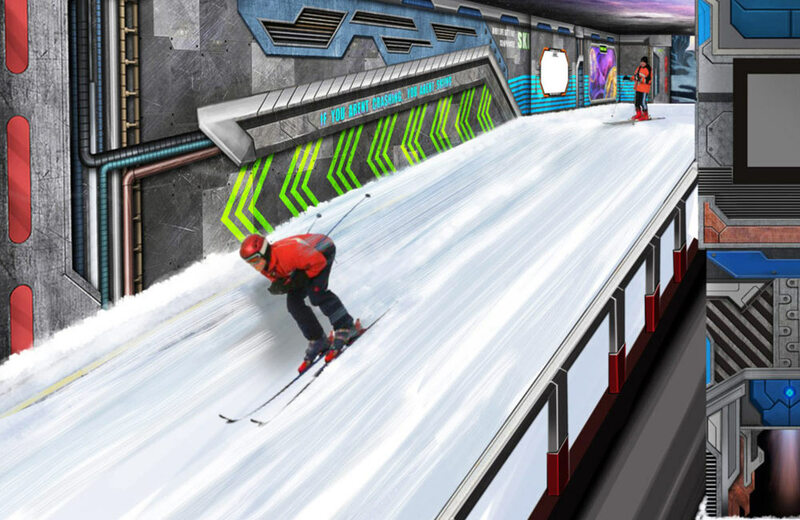 SKI India brings Switzerland to Noida with its high-end Sci-Fi set up and an indoor facility that is akin to a snow-capped hill station. Spreading over 1 lakh sq. feet, the area caters to the fantasies of snow buffs in the city. The -10-degree temperature is going to give you the chills and make you go looking for cover. Buying an entry ticket would mean endless snow spin through activities like Skiing, Bob Sled, Snow Boarding, Sledding, Snow Fall, Eskimo-life in an Igloo, Ice Skating, Toboggan, Caves Frozen, Walk Through, and Snow Carousel. The entry ticket also includes snow gears like gloves, ice skating shoes, jackets, hood, boots, ski & skiing sticks. You can warm up with some hot tea and snacks available at the venue for that extra energy supply. Join forces with the snow mascots at SKI like TUX, Y-TIMO, WOMPY, Z-TIMO, X-TIMO, DR.KIT, D-FLY, BYNO, N-TINA, and ORRI guiding you all the way on how to have some chilled-out time during your snow adventures. This is the best place to be during the merciless summers in Noida, and your children will definitely thank you for it. Touted to be the second largest indoor snow park in Asia, SKI has two floors of snowy bliss. It will be interesting to note that an illuminating wormhole design at the entrance gives an impression to the visitors that they are being swallowed in, which quite spectacular. The time allocated to snow lovers to enjoy the snow fantasy is one hour with an extra thirty minutes allocated for gearing up at the reception for the ‘thanda thanda cool cool’ adventure. These are the top four recreational venues in Noida where the sun may go down but the fun never does. Each of these places can bring out your energetic self quite frivolously and help you give in to your whimsical fancies. The physical elevation and the mental elation experienced at these locations can get you charged up and refreshed for a better week ahead and render some time away from your day-to-day rigmarole. So, get out of your hotels in Noida and be the boss of your own good times at any of the above places where fun is taken seriously.